The first version, Biomodd [ATH1], was created by Angelo Vermeulen during an artist residency at The Aesthetic Technologies Lab at Ohio University's College of Fine Arts in Athens, Ohio between September 2007 and January 2008. Biomodd [ATH1] reflects our attitude towards technology: never satisfied with the status quo, machines are endlessly evolved, systems are boosted and performance gets violently pushed. Overclocking of computer processors becomes a metaphor of contemporary society; a society fascinated by growth and productivity but at the same time generating massive amounts of excess heat. Biomodd [ATH1]tries to visualize and rework the intricate relation of organic life, technology and consumption. Inspired by the case modding scene, a large custom computer system is built as a form of expanded sculpture. In case modding, computer components are often severely overclocked. Overclocking is practiced to increase performance but as a side effect generates large amounts of heat. And it’s exactly this excess heat that is central in Biomodd [ATH1]. For Biomodd [ATH1]a large and atypical computer case is created. Inside this transparent structure the heat is recycled by an elaborate living ecosystem composed of different foms of plant life. The computer is as such transformed into a greenhouse and a living, pulsating cyber-sculpture. Apart from an ecological statement, Biomodd [ATH1]is also an explicit social project. The Biomodd [ATH1]structure is built together with local biology, game and art enthusiasts. The computer structure is then used as a server for a computer game equally developed with the group. The objective of the game is to bring some of the themes of Biomodd [ATH1] into an interesting multiplayer game experience. 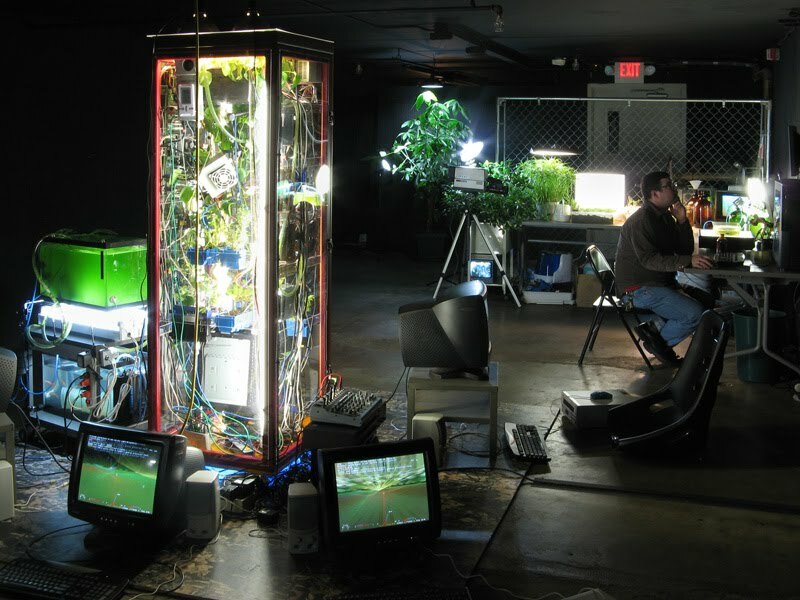 The computer sculpture is surounded by individual game stations. Exhibition visitors can join in the multiplayer experience and become part of the installation. Through playing, they actively modify the piece by generating heat and affecting the interior ecosystem. This documentary was created by Morgan Riles in 2007 and 2008. The film follows the creative process and explores new ideas in contemporary art installations from the perspective of Angelo Vermeulen’s young collaborators: Jeff Lovett, John Seyal, Daniel Mintz, and Scott Sullivan. Filmmaker Morgan Riles directed this feature production as her Ohio University thesis. Biomodd [ATH1] has screened at the 27th International Festival of Films on Art, and the Houston Cinema Arts Festival, 2009. The full film is now available online.